The chemical formula for Ferrochrome is FeCr. Ferrochrome is manufactured by conducting carbothermic reduction of iron magnesium chromium oxide under high temperatures. 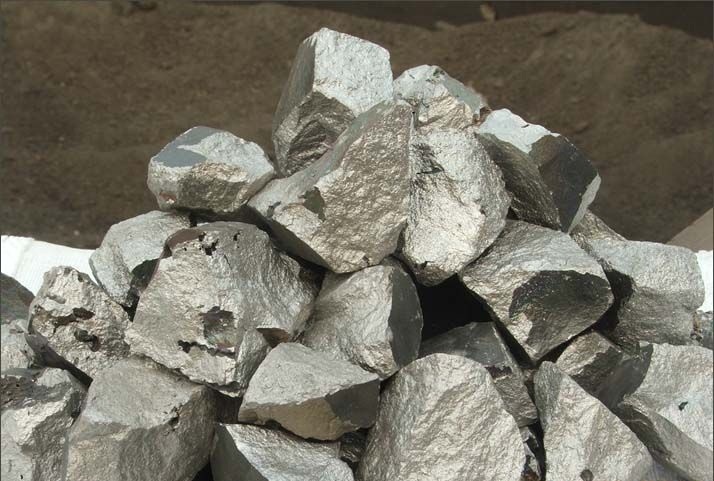 Iron-chromium alloy is produced by the reduction of Chromium Ore by the application of coal and coke. This reduction process requires heat which comes from the electric arc of the furnace. The arc is able to create temperatures around 2800 °C. A great amount of electricity is consumed while producing such intense heat which makes this a very costly process. Ferrochrome is collected from the furnace at regular intervals. Once a considerable amount of the iron-chromium alloy is produced in the furnace, the slag and the molten metal is extracted from the tap hole which passes through a trough and is collected on a ladle or chill. The molten ferrochrome is then solidified in large castings and then processed further. Ferrochrome can be of two types based on the amount of carbon it has; low carbon Ferrochrome and high carbon Ferrochrome. Most of the Ferrochrome in the world market comes now from places like South Africa, Kazakhstan, India and Turkey. In these counties, the substance is produced in specialized Ferrochrome plants. Atomic Mass: The atomic mass for this alloy is 52.0. Density: The apparent density for this compound is 7.15 g/cm3. Melting Point: The melting point for this substance is 1900 °C. Boiling Point: The boiling point for this alloy is 2642 °C. Appearance: Ferrochrome is available in a variety of forms, including small crystals, lumps and granules as well as in powder form. Color: The color varies from dark gray to light gray. Odor: Odorless; can be dangerous when inhaled. Solubility: The alloy is not soluble in water. Combustibility: The dust particles of this chemical alloy are combustible. Most of the ferrochrome produced worldwide is used in manufacturing stainless steel. The chromium content present in stainless steel provides resistance to corrosion as well as gives stainless steel its customary appearance. Around 18% of chrome is used in per unit content of stainless steel. Ferrochrome is also used when more chromium is needed to be added to carbon steel. High carbon ferrochrome is used in the manufacturing of ball-bearing steels, tool steels as well as other alloy steels. Apart from making stainless steel, low carbon ferrochrome is also used in the manufacturing of acid-resistant steels. High nitrogen ferrochrome is created by adding 0.75% of nitrogen to the different grades of ferrochrome. This nitrogen-rich alloy is used for manufacturing high-chromium cast steels having a coarse crystalline structure. The nitrogen content produces refined grains and adds strength to the finished product. Foundry-grade ferrochrome containing around 62-66% chromium and almost 5% carbon is used for producing cast irons. Ferrochrome powder is used in the field of powder metallurgy. Ferrochrome slag is a chemically stable substance. It is used in road construction and civil engineering as well as in the production of refractory materials. Ferrochrome is used in the production of Ferrochrome lignosulfonate. Ferrochrome lignosulfonate is used in various water-based systems to control flow of materials at high levels of temperature as well as to reduce the ill effects of mud and clay contamination. Ferrochrome lignosulfonate operates well in gypsum, fresh water, lime and salt water fluids. Ferrochrome dust is used in the leather tanning industry. While dealing with this alloy, care should be taken to protect the eyes from getting in contact with this material or accidentally inhaling or ingesting it. Under certain conditions, this material can also catch fire. Hence adequate protective measures are needed to be followed to avoid such mishaps. The probable dangers posed by this alloy and the protective measures that are needed to be followed are discussed below in details. Skin: It can cause irritation to the skin. Eyes: Contact with the eyes causes swelling and redness. Inhalation: Inhaling this chemical compound might result in coughing and irritation of the respiratory tract. Ingestion: Accidental ingestion can cause irritation to the mouth. Eyes: In case of an eye exposure, the eyes should be washed with plenty of water for several minutes. A doctor should be consulted after that. Skin: In case of a skin contact, the infected skin areas should be rinsed with water for several minutes; a dermatologist should be consulted immediately. The contaminated clothing should be removed immediately and the clothes and shoes should be washed properly before being reused. Ingestion: In case of ingestion, the victim’s mouth should be rinsed properly with water and then proper medical treatment should be carried out. Inhalation: The victim should be immediately removed to an area of fresh air. Artificial respiration and oxygen should be employed if needed. To ensure the victim’s safety, further medical help should be administered. P2 filter respirators are required for respiratory protection from harmful particles. Safety goggles or protective eyewear approved by OSHA is needed for the protection of eyes. Protective gloves and clothing is to be used to avoid skin exposure. Smoking, drinking or eating near the storage facilities is strictly prohibited as this can lead to fire hazards or accidental ingestion. The chemical spills should be cleaned up immediately and the spilled materials should be stored in suitable containers. It is better to moisten the spills as this will prevent dusting. Dispersion and spreading of the alloy dust should be avoided. Installation of proper ventilation is required at the storage section. Dust particles of Ferrochrome can explode and combust. It is thus advised not to have any open flames near Ferrochrome powder. Spreading of dust also needs to be prohibited. While handling this chemical substance, ignition-proof electrical equipment needs to be used. Ferrochrome can be bought from chemical suppliers all over the world online or otherwise in the form of granules, dust particles and lumps. Ferrochrome wires can also be bought from such suppliers. The price of ferrochrome may vary among the various producers and suppliers of this alloy. Generally, buying a minimum quantity of dust particles or granules is considered mandatory. Average price of Ferrochrome dust per metric ton is around $850 to $900. Ferrochrome is a valuable alloy without which the production of stainless steel would be impossible. It is also used for several industrial and well as non-industrial purposes.